Cycle Sport April is out now in the United Kingdom. If anything, we’ve made it too good. Our cover star this month is Fabian Cancellara. The world time trial champion transferred to the Leopard-Trek team during the off-season, along with the Schleck brothers and the core of Saxo Bank. We accompanied Cancellara and Leopard-Trek to their training camp on Majorca and spent a day observing the riders as they trained and underwent hill-climbing tests. (The team wouldn’t let us publish the results of the hill tests, but be prepared for a strong year from Frank Schleck). For a rider whose winning margins are so overwhelmingly huge (see last year’s Tour of Flanders and Paris-Roubaix for a demonstration), Cancellara is incredibly focussed on details. Everything has to be perfect for him, even down to burning the ends of his helmet straps with a lighter to stop the threads fraying. 2011 will be an interesting season for Cancellara. He told CS last year that he’d prefer to win Liège-Bastogne-Liège and the Tour of Lombardy once than the Tour of Flanders three times, leading to speculation that he would concentrate on building a career grand slam of Monuments, rather than aim to dominate in the cobbled classics. But with Leopard-Trek aiming to win big races from their first year in the sport, are we going to see a Flanders-Roubaix swansong from Cancellara in 2011? We’ve had a relationships of ups and downs with Lance Armstrong over the years. More downs than ups, to be honest. If we represented our relations by means of a graph, there’d be a flat line along the X-axis from 2002 to November 2008, when he agreed to an interview. The line would then blip upwards, and then down to the X-axis from around December 2008, when he stopped talking to us again. Cycle Sport was present at the Tour Down Under, on the occasion of Lance Armstrong’s last international race. We got dirty looks from his entourage, watched him ride almost anonymously and observed one of the final acts in the career of possibly the most controversial rider in the history of cycling, as he turned his gaze from Australia to the ticking time bomb of the federal investigation. 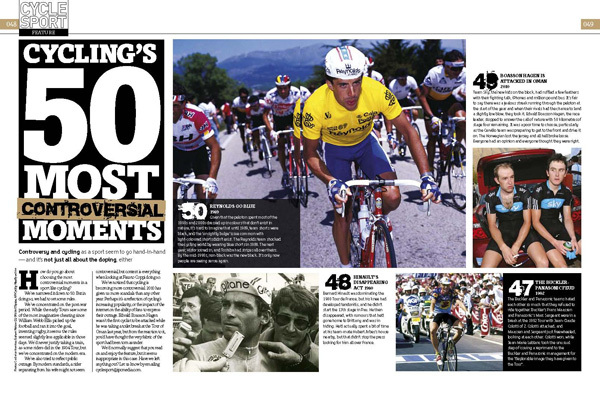 Our special feature for CS April is a look at Cycling’s 50 most controversial moments. In truth, we had a great deal of difficulty narrowing down our shortlist (well over 100 incidents! ), even after we’d limited it to the postwar period. It makes for a sorry read, but there are moments of humour as well as serious scandal. From the introduction of coloured cycling shorts, through wee-gate, chain-gate, Manolo Saiz swearing on television, Jesper Skibby being run over by a car on the Koppenberg to the huge doping scandals of the last 20 years, join us for an unedifying account of the dark side of the sport. There’s a brand new regular column by Sky rider and British champion Geraint Thomas. This month, Geraint shares anecdotes of crashes and fatigue, and rashly reveals his six new season’s resolutions. We’ve interviewed former world time trial champion Bert Grabsch. It’s no exaggeration to say that the German HTC-Highroad rider is one of the most effective and valued domestiques in the peloton. He contributed to more victories in 2010 than any other rider in professional cycling, and his HTC managers say that without Grabsch, Cavendish doesn’t win the race. 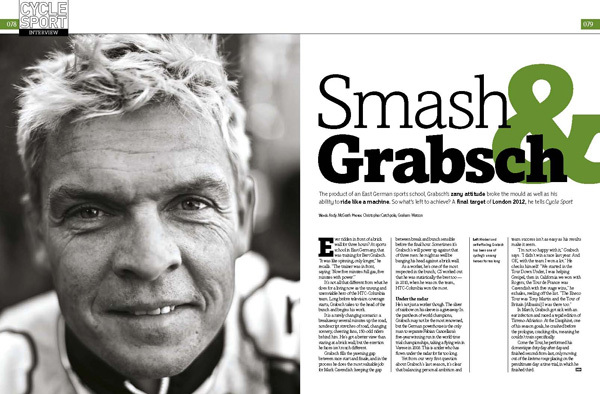 But in a sensitive and revealing interview, Grabsch tells Cycle Sport that he still harbours ambitions for himself. 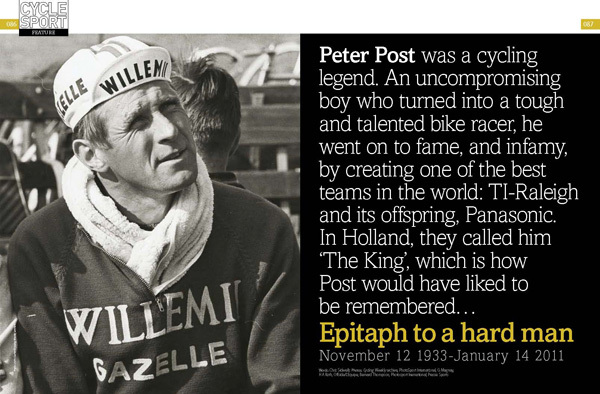 Peter Post, who died recently, was one of the most uncompromising and successful team managers of all time. He ran the TI-Raleigh, then Panasonic teams in the 1970s and 1980s. We’ve spoken with former team members, who have shared anecdotes that show both sides to Post’s character, for our piece, Epitaph to a hard man, which also features stunning contemporary photography. How does it feel to be the most unpopular sprinter in the world? We’ve asked that very question to Australian rider Graeme Brown, who has long had a reputation for causing carnage in the bunch finishes. We were surprised to find that Brown is a quiet, thoughtful character, who has faced up to the misdemeanours of his youth, and is concentrating on sprinting correctly, and riding responsibly. We have a photo feature showcasing the early-season action at the Tour Down Under and Ladies’ Tour of Qatar. It’s been a pleasure to see some racing at last, even though it’s repeatedly overshadowed by political scandals in the sport. Iconic Places pays tribute to the key climb of the Ghent-Wevelgem Classic, the Kemmelberg. The climb, which was a focal point of fighting during the first world war, is only a short cobbled stretch, but it’s steep, and gives Ghent-Wevelgem a unique character. It’s also one of the most atmospheric fan experiences in the sport. In Location, Location, Location we look at the hotspots for where professional cyclists are born. We’ve analysed the birth data of every ProTeam rider, plus another few teams’ worth from the ProContinental division and found that while globalisation has had an effect on the origin of riders, there are still a few very clear hotspots – in Flanders, the Basque Country and northern Italy. The 2011 Vuelta a Espana returns to the Basque Country on the official route for the first time in 33 years. We explain how politics and the threat of terrorism formed a schism between Spain and this cycling heartland for so long, and look forward to a long-overdue return. Finally, we delve into what looks like The demise of Campagnolo. Only four ProTeams are using the Italian brand of cycling components in 2011, while Shimano and Sram go from strength to strength. But Campagnolo are confident in their product, and tell us that they are determined to protect their heritage in the sport. 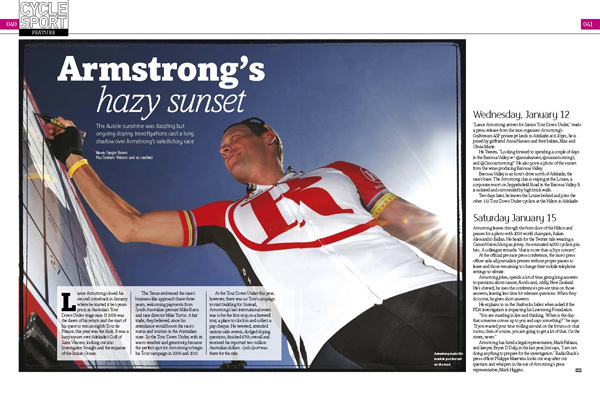 Plus…All our regular features – Shop Window, with extravagantly shiny bike bits; Graham Watson reports back from the Tour Down Under; Broomwagon – Race radios, top 10 riders whose names make us feel hungry, and Faulty Towers(sic) with Hein and Lance; Q&A with Philip Deignan; the top 10 victory celebrations and much much more. That’s 11 features, plus all the extras, for the irrationally reasonable price of £4.25. 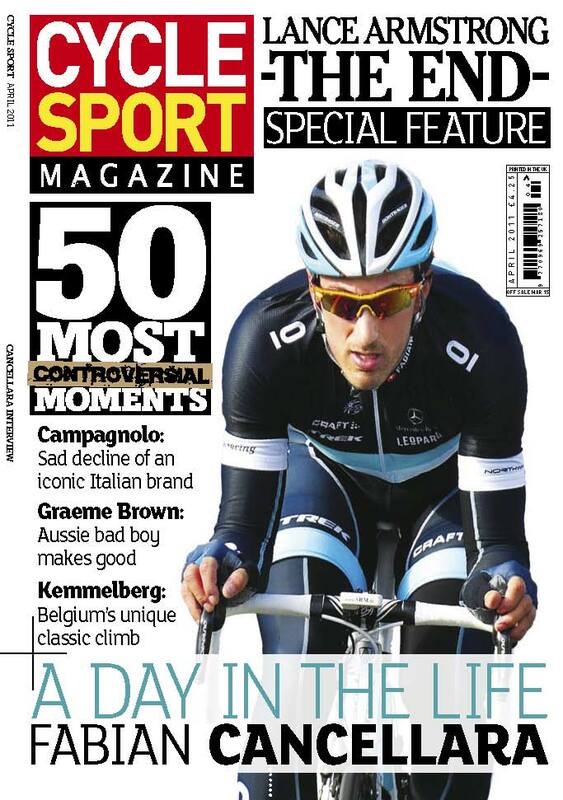 Cycle Sport April is on sale in the UK from Wednesday February 16, and will be available later in the US.